straight from the Brooklyn break dance scene, we introduce the biggest fad on the Brooklyn streets since black top hats - the "Roborabbi"! 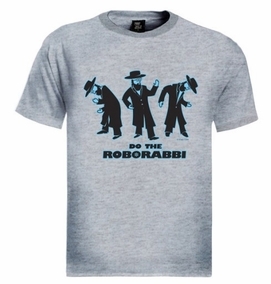 Get your awesome Roborabbi T-shirt and join the hippest yeshiva kids of today doing the Roborabbi! How to dance the Roborabbi: You too can "Roborabbi" by performing these 3 easy steps: 1. Become a certified rabbi. 2. Get a black suit and top hat. 3. Do the robot. Congrats- you're "Roborabbying"!! Our t-shirts are made of 100% cotton and are long lasting with bright colors. Our products are all designed and printed in Israel.